Build More Effective Relationships at Work. 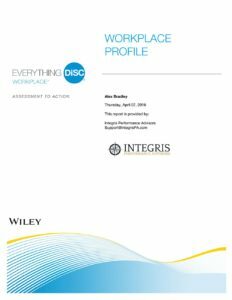 The Everything DiSC®Workplace profile can be used with everyone in an organization, regardless of title or role. You’ll get in-depth tips, strategies, insights into your style, and action plans to help you become more effective at work. The result is more productive working relationships. Extensive resources to help keep learning alive long past the initial assessment-taking or classroom experience. While there are many theories of personality and dozens of models in the marketplace that assess—to varying degrees of accuracy and usefulness—an individual’s specific style and behavioral preferences, Everything DiSC®stands apart for its simplicity and memorability. Ready to learn more how Everything DiSC® can help you have the crucial conversations that will build more effective work relationships and healthier workplaces? Download a sample profile to see for yourself.